Manufacturers know that exporting is one of the primary growth factors for any economy and that it is profitable for businesses of all sizes. According to a study published by the Institute for International Economics, U.S. companies that export not only grow faster, but are nearly 8.5 percent less likely to go out of business than non-exporting companies. 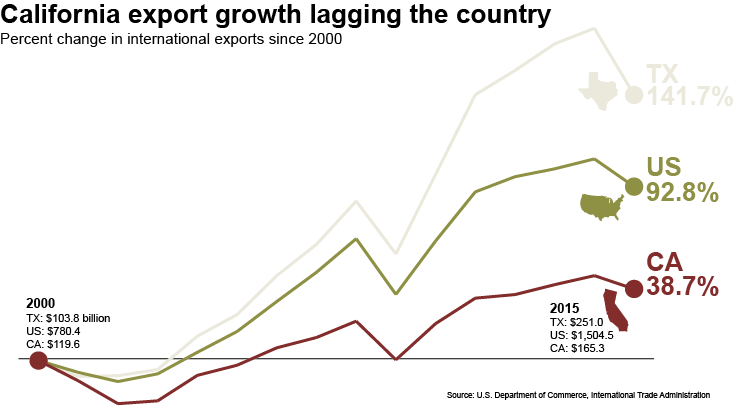 About a decade ago California, for the first time, got passed in total exports by Texas. The general slowdown in the Golden State started in 2000 but has continued over the last 15 years. According to U.S. Department of Commerce data, we lag the country's export growth by a large margin. California was by far the export leader in the second half of the 20th century. Now 16 years into this Century we have less than 40 percent export growth compared to the rest of the country's 92 percent growth. For many reasons, other states are attracting more manufacturers who export goods. Our policymakers in California should use this as another reason to ensure we're doing all we can to attract our share of manufacturers. A quick look at California exports vs the U.S. Recently TechAmerica reported that California for the first time lost its status as the top technology exporter in the country, with Texas surpassing us with $45.1 billion in technology exports to our $44.8 billion. We thought this would be a good time to look at the trend of our overall exports versus Texas and the rest of the country. Below is the percentage growth in exports since the country started to emerge from its recession in 2010. California at 17.4 percent is growing but trending behind the country's 23.3 percent, as well as Texas' 35.2 percent. This week, CMTA President Jack Stewart participated in a California exports and manufacturing panel at the Southern California Advanced Manufacturing Expo. To prepare we compared the state's exports with our largest competitor over the last decade. Texas passed us for the first time back in 2002 and they haven't looked back since. In fact their exports have grown by 144 percent while we have lagged at 33 percent growth.